The same river. The upper part is the Kjarra, the lower part the Thvera. It even has a third name in the middle, Ornolfsdalsa. It also has a significant tributary, the Litla-Thvera. It is one of the main tributaries to the glacial artery Hvita. 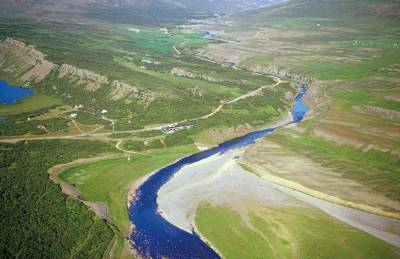 The river Thvera/Kjarra is one of Icelands five star salmon fisheries. It came in second in 1998 with almost 2.200 salmon and is always in the top five and rarely producing fewer than 1.800 fish in a season but year 2005 was one of the best year where Þvera og Kjarra landed 4151 salmon.